Okazaki Castle (岡崎城) is located Okazaki, Aichi. It is chosen as the one of the 100 best castles in Japan. It is medium size castle with Gokoku Shrine located in the Honmaru. The Original castle was used to be 4th biggest castle in Japan. 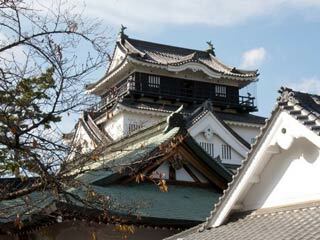 Okazaki Castle is known as the birthplace of one of the most influential men in Japanese history, Tokugawa Ieyasu. The original castle dates from 1455 and was built on the grounds of Myodaiji Temple by Saigo Tsugiyori. The castle was moved to its present location by Ieyasu's grandfather in 1531. After Ieyasu was able to take control of the whole of Japan following the battle of Sekigahara and the defeat of his rivals the Toyotomi clan in 1600, he moved his base of operations to Edo (present-day Tokyo). Okazaki Castle was then occupied by vassals of the Tokugawa until 1868.